Image Title: Have a seat please! You are welcome:)))Thank you for your kind words! Thanks for...! Really wonderful arangement. Eye catching. WOOOOOOOOW..So lovely and inviting, excellent arrangement, nicely balanced well done my sweet friend. I'm ready too...LOL!!! !Thank you very much for your funny words!!! Really nice and amazing view point. Yes Mehul and it was a beautiful and a romantic place.A VERY good restaurant with a fantastic fish dinner!! Thank you very much mehul! Fantasic shot, did you have dinner her? Yes indeed it was such a beautiful place just near the sea with a fantastic dinner and so quiet and peaceful! !I'm sure that you would love it too!!! Thank you so very much for your always kind words to me my dear!!! Superb image Nicki,excellent in every way. It was really a great place with a fantastic view and a perfect dinner!!! Hope that you will have a nice off day too!!! Anytime you want Diego !Thank you very much!!! Thank you very much Erland! Beautiful setting with very nice colors and great flame making this a very romantic picture. ... what time I have to be ready for dinner? Well...It's my big pleasure,my sweet friend. Wish you and yours a great weekend. I would be nice to have a dinner together with you my dear Keith:)))This was such a beautiful place with view to the sea!And the dinner was just PERFECT!!!! Thank you Mohsen...for your lovely comment and for stopping by to have a look at my photo! Yes indeed it was a PERFECT place Bill...thank you!!! ...a wonderful dinner:)Thank you so much Galal! Thank YOU so much dear Stan...what lovely words to hear :)) I appreciate your support so very much!!!!! I do appreciate your kind words my dear friend!!! Thank you my best friend and see you there... !!! I'm sure you'll manage it for next year to see the sea...will cross my fingers!!!! Thank you my sweetie for your always kind words and enjoy the nice Sunday ! Thank you so much Mitra! Kind of you dear friend Rino... thanks for your visit! So lovely and inviting, well done. oh how lovely and emotive! very nice work dear friend. well done! 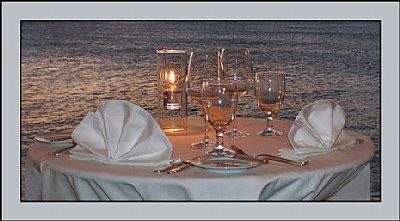 inviting table with beautiful view!! very well composed! beautiful , romantic frame!! Can't see a sit ! Excellent composition,amazing colour and ligting. You are the master,my dear. “It’s really great to talk to you again! “Well, shall we make a date? Dinner? How’s this week..? How about the week after next? Nice lighting, flash fill just a tiny bit on the strong side. So beautiful and elegant. Well done dear Nicole. Thank you Dear, I'm coming emmediately!!! !